Firewall is one of the most important security software for any computer. Windows 7 includes firewall to protect the computer against Malware, Malicious software and unwanted programs from internet and intranet. Firewall will monitor the incoming and outgoing connections. Windows XP includes first built in firewall for Windows OS. Windows 7 firewall is flexible to use and configure the settings. Windows 7 firewall includes more options to configure the firewall and it seen in control panel. Windows 7 includes advanced settings will provide more options and ports at the granular level will have more control over the firewall. Windows 7 firewall includes Home or work (private) networks and Public networks settings, so that separate settings can be done for the Home network and as well as public network. Using Home network option you can see the computers that are connected to the network private network. We can share files or folders to the networked computer. You can change the settings to disable the access to the shared folder and files. Public network should be configured in order to reduce the risk, because public network connections are not secured network, so do not use bank web sites or other sites that requires personal or sensitive information. By default it will notify the unauthorised incoming connection to the computer. 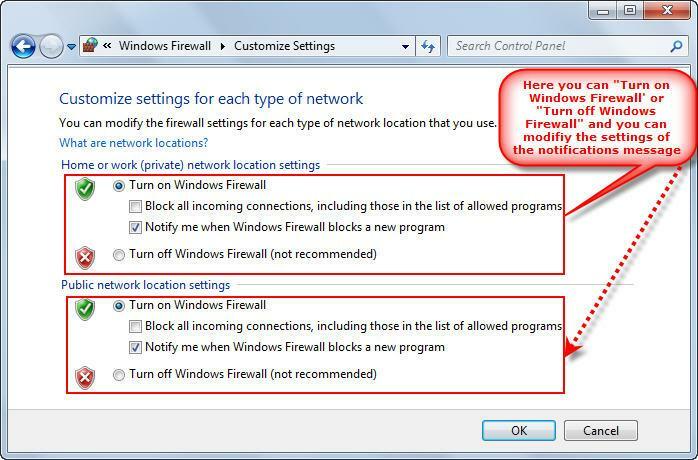 Notifications can be modified by using Change notifications settings on the left side of the Windows firewall. 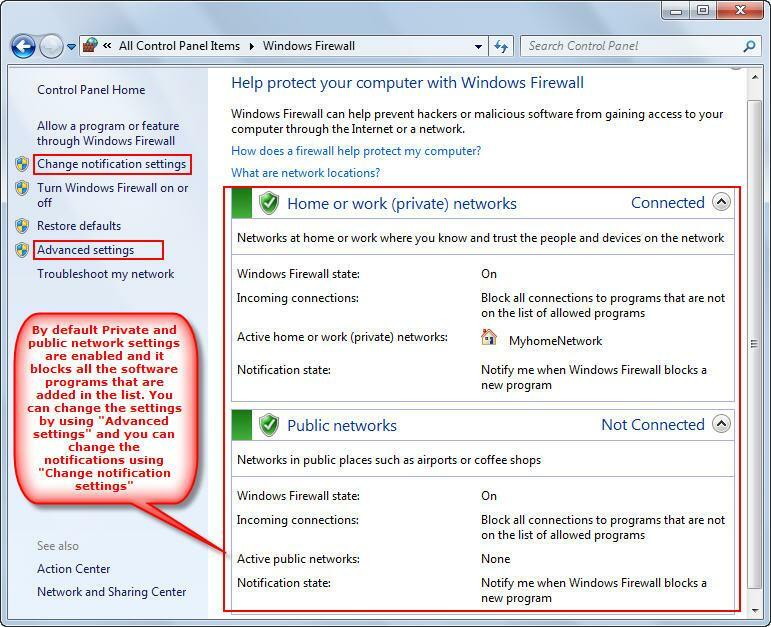 By default for both the private and public connections firewall will block all the programs that are not added in the firewall list. In Windows 7 we can create multiple profiles and it can be applied to the private and public network. Each connection will use the assigned profile and it will use the rules that are configured in the profiles.